Streamlined Analysis with ADePT Software is a new series that provides academics, Students and policy practitioners with theoretical foundation, practical guidelines and software tools for applied analysis in various areas of economic research. Simulating Distributional Impacts of Macro-dynamics: Theory and Practical Applications is a comprehensive guide for analyzing and understanding the effects of macroeconomic shocks on income and consumption distribution, as well as using the ADePT Simulation Module. Since real-time micro data is rarely available, the Simulation Module (part of the ADePT economic analysis software) takes advantage of historical household surveys to estimate how current or proposed macro changes might impact household and individuals welfare. Using examples from different economic and social contexts, the book explains macro-micro linkages in an easy and intuitive way. After developing a sound theoretical foundation, readers are then shown how to explore their own scenarios using the Simulation Module. Step-by-step instructions illustrate data entry and show how to make adjustments using the Module’s options. Exercises present how different sections of the simulation process operate independently. This book will be a valuable reference for analysts needing to evaluate the potential impact of structural reforms and to generate projections for hypothetical scenarios. Results created by the Simulation Module will be helpful in informing governmental policymaking. Download full text in PDF from the Open Knowledge Repository. 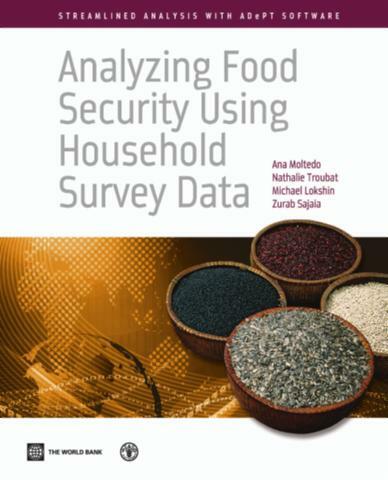 This book describes Food Security Module of ADePT (stand-alone software available for free downloading). The software was developed to produce a suite of indicators necessary to describe food insecurity in all its dimensions, based on food consumption data collected in household surveys. These indicators, derived at the national and subnational levels, include the consumption of calories and macronutrients, the availability of micronutrients and amino acids, the distribution of calories and the proportion of people undernourished. The book embodies decades of experience in analyzing food security and focuses on the theory, methodology, and analysis of these indicators. A Unified Approach to Measuring Poverty and Inequality: Theory and Practice is an introduction to the theory and practice of measuring poverty and inequality, as well as a user's guide for analyzing income or consumption distribution for any standard household dataset using the World Bank's ADePT software. The approach taken here considers income standards as building blocks for basic measurement, then uses them to construct inequality and poverty measures. This unified approach provides advantages in interpreting and contrasting the measures and in understanding the way measures vary over time and space. This manual provides comprehensive instructions for installing and using ADePT software. It covers main steps in performing analysis; describes the content of the report generated by ADePT; and provides instructions for viewing variables and observations, generating, replacing and deleting variables and related function. The manual also explains how to set ranges, weights and other module-specific factors that ADePT will apply during its processing; and provides help if problems are encountered while installing or using ADePT. Download full text in PDF. ADePT Health is a free-standing computer program that allows users to produce quickly - and with the minimal risk of errors - most tables that have become standard in applied health and equity analysis. ADePT produces summary statistics and charts that allow inequalities to be compared across countries and over time. This manual explains the methods ADePT uses, how to prepare data for it, how to navigate the ADePT interface to generate the desired tables and charts, and how to interpret them. The objective of the manual is to assist education analysts and policy practitioners in their assesmment of education sector performance, internal efficiency, finance, and equity. It is a technical and analytical resource that takes full advantage of ADePT Education, a software tool that allows for the calculation of education indicators from micro-level data. IT provides technical definitions of more than forty indicators and step-by-step instructions for the preparation and analysis of indicators of internal efficiency and inequality. It also assists users in the interpretation of results, the prioritization of policy issues, and in the generation of tables and graphs that can be used to bolster their own analysis. Click on book cover to read it on-line.